The abstractmachine is setup in San Jose, there is a breakcore Rubik’s Cube® kicking out the jams, a programmable video mosaic recorder is open for public abuse, and the Hypertable is unleashing a non-linear interactive documentary containing a telepathic virus. We’re setup in the main exhibition hall for the festival, South Hall. Oh, I should also mention something after having watched a few visitors this afternoon: um, hello, people out there, yes, you can actually pick up the Rubik’s Cube® and play with it. And that interactive table, yes, you can put your hands on it. Most of you reading this are probably in the know, and would find it laughable that people would fear interacting with an installation during a festival dedicated to digital art. But hey, that’s apparently America. It’s my first show in my home country (yes, that’s right) and I guess the public is just like that. I always figured that the dopey Americans who looked confused were just like that because they were tourists lost in Europe. But who knows, maybe there are just a lot of tourists showing up today. So with that out of the way, here’s the official statement. Through various experiments, installations, and online software, the abstractmachine project asks the question of how we as artists and users can create, manipulate, and ultimately enact digital algorithms. If the specificity of the computer comes not only from it’s digital aspect, but even more so from it’s algorithmic aspect, how does this hyperprogrammable nature transform the media we manipulate — i.e. the images and sounds we design using these machines? Amongst the many machines available within the abstractmachine project, two creation platforms will be presented to illustrate our response to these questions: one dedicated to the creation and manipulation of algorithmic cinema, the other designed around algorithmic musical composition. « 3 », a.k.a. « ^3 », a.k.a. « cubed » is a musical sequencer integrated into a Rubik's Cube®. By manipulating the colors on the cube, users generate different sound algorithms within the sequencer. Using specially-designed soundfonts from Jankenpopp (cf. http://jankenpopp.com), math geeks can finally become the speedcubing breakcore supernerds they always feared were lurking underneath. With ^3 we are working against the idea that a musician has to create music with audio software where building the musical algorithm and manipulating the digital algorithm are two different processes. Often, making digital music looks a lot like someone working on their spreadsheet. In ^3, all of the notes of the musical process are visible and intrinsically intertwined. Using a universally known interface, a series of simple gestures cascade into a complex multitude of musical possibilities. Concrescence is a platform for creating and manipulating moving images outside of the traditional linear time-code. Images grow in spatialized mosaics, allowing for infinite recomposition while avoiding purely random associations. 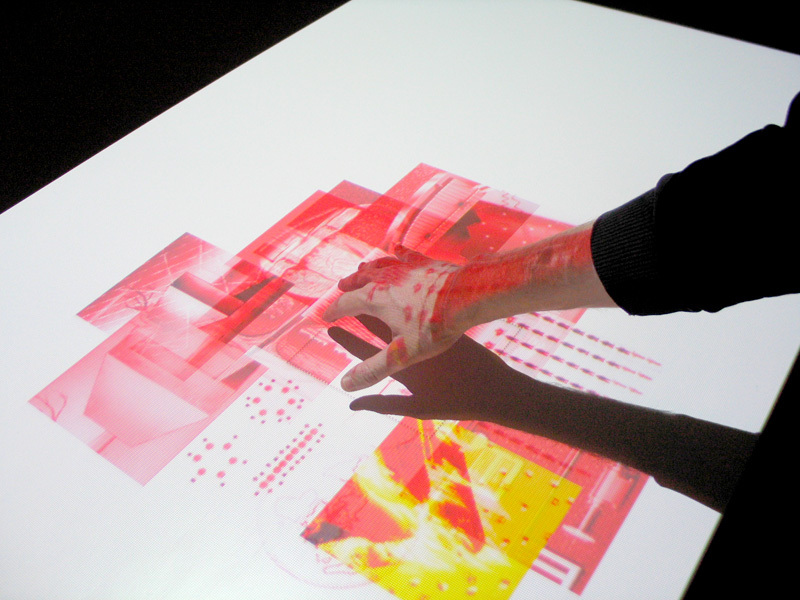 This specialized software is then projected onto the Abstractmachine Hypertable: a multipurpose interactive table which allows multiple users to interact with the non-linear narratives by simply placing their hands on the surface. For the San Jose festival, two uses of the Concrescence platform will be presented: a fully developed algorithmic narrative entitled “The Signal”, accompanied by a simplified version of the Concrescence authoring software where the public can record their own audiovisual clips and create collective non-linear patchworks.